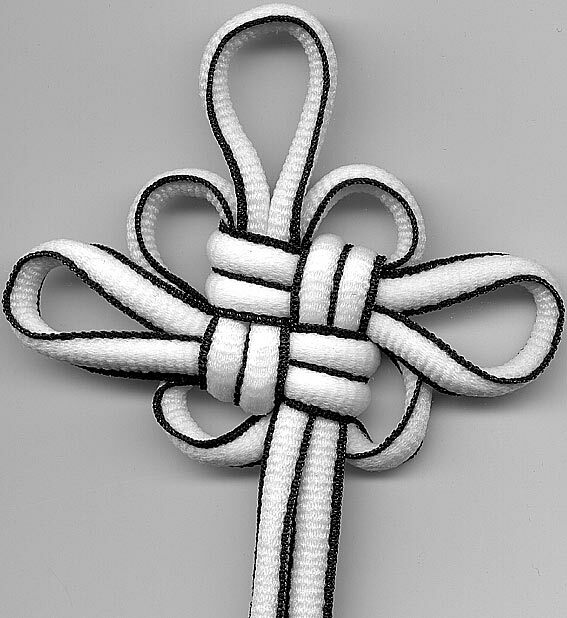 The basic crown knot tied the same way each time will result in a round sinnet. The crown knot tied in alternating directions will result in a square sinnet. The good luck knot is a double crown knot tied on the bight (using loops formed from a single cord, tie 2 crown knots in sequence). 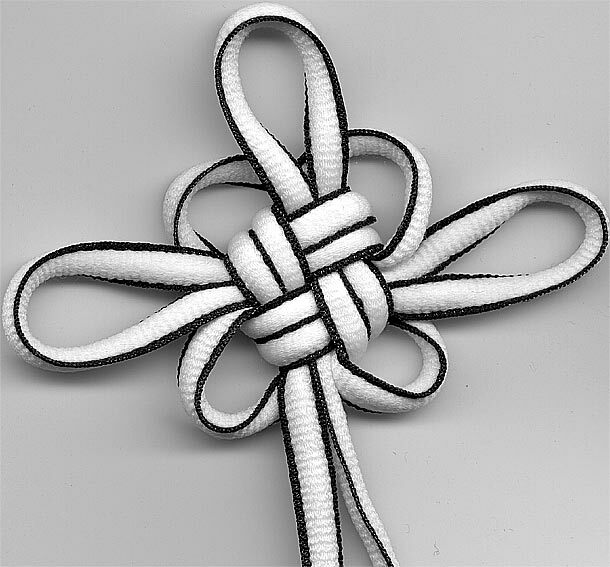 The traditional good luck knot is tied in alternating directions to give a nice crisp angular shape (square when tied with 4 loops, pictured to the right). The non-alternating, round version in Japanese literature is the chrysanthemum knot (菊結び, pictured to the left). Admittedly, the difference is fairly subtle visually, but some find that when hanging the knots that the Japanese chrysanthemum hangs better owing to the smidgen extra tilt towards centre. And, because nothing can be that simple, the Korean chrysanthemum knot (국화매듭) is the mystic knot, an entirely different knot. In my "Maedeup: The Art of Traditional Korean Knots" by Kim Hee-jin, the good luck knot in Korean is the Dongsimyeol Maedeup (동심결매듭) translated as "One Mind Knot". That sounds like a machine translation that didn't get a once over from real translator. One of the other knots in this grid is called a "crawfish eyes knot." Cool, although the translated names of many of the other ones make more sense. Fun, eh? 8) Hey, if you (gentle reader) are a Chinese, Japanese, or Korean (reading and typing) crafter and would like to help me translate things from time to time, I'd love to hear from you!